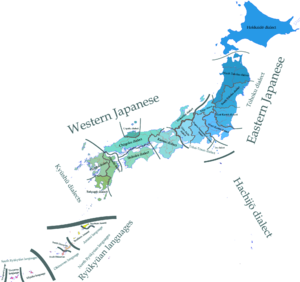 The extant Japonic languages comprise two well-defined branches. Kyushu dialects, spoken on the island of Kyushu, including the Kagoshima dialect/Satsugū dialect, spoken in Kagoshima Prefecture in southern Kyushu. The Hachijō language, spoken on Hachijō-jima and the Daitō Islands, including Aogashima, is highly divergent. The oldest attestation of the Japanese branch is Old Japanese, recorded using Chinese characters in the 7th and 8th centuries. Since Old Japanese displays several innovations not shared with Ryukyuan, the two branches must have separated before the 7th century. The move to the Ryukyus from Kyushu may have occurred later, possibly conciding with the rapid expansion of the agricultural Gusuku culture in the 10th and 11th centuries. ^ Shimabukuro (2007), p. 1. ^ Miyake (2003), p. 66. ^ Frellesvig (2010), pp. 12–20. ^ Pellard (2015), pp. 21–23. ^ Pellard (2015), pp. 30–32. ^ Vovin (2013), pp. 222–224. ^ Lee & Ramsey (2011), pp. 37–43. ^ a b Vovin (2017). ^ Beckwith (2007), pp. 50–92. ^ Vovin (2013), pp. 236–237. Beckwith, Christopher (2007), Koguryo, the Language of Japan's Continental Relatives, BRILL, ISBN 978-90-04-16025-5. Frellesvig, Bjarke (2010), A History of the Japanese Language, Cambridge: Cambridge University Press, ISBN 978-0-521-65320-6. Martin, Samuel Elmo (1987), The Japanese Language through Time, New Haven and London: Yale University Press, ISBN 978-0-300-03729-6. Miyake, Marc Hideo (2003), Old Japanese: A Phonetic Reconstruction, London; New York: RoutledgeCurzon, ISBN 978-0-415-30575-4. Pellard, Thomas (2015), "The linguistic archeology of the Ryukyu Islands", in Heinrich, Patrick; Miyara, Shinsho; Shimoji, Michinori (eds. ), Handbook of the Ryukyuan languages: History, structure, and use, De Gruyter Mouton, pp. 13–37, doi:10.1515/9781614511151.13, ISBN 978-1-61451-161-8. Shimabukuro, Moriyo (2007), The Accentual History of the Japanese and Ryukyuan Languages: a Reconstruction, London: Global Oriental, ISBN 978-1-901903-63-8. Vovin, Alexander (2013), "From Koguryo to Tamna: Slowly riding to the South with speakers of Proto-Korean", Korean Linguistics, 15 (2): 222–240, doi:10.1075/kl.15.2.03vov. ——— (2017), "Origins of the Japanese Language", Oxford Research Encyclopedia of Linguistics, Oxford University Press, doi:10.1093/acrefore/9780199384655.013.277.